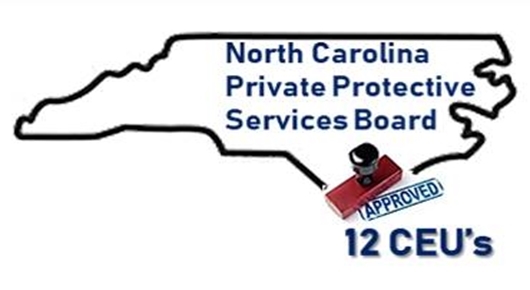 The purpose of the Private Protective Services Board is to administer the licensing, education and training requirements for persons, firms, associations and corporations engaged in private protective services within North Carolina. In March 2016 the North Carolina Private Protective Services Board approved 12 continuing education credits for completion of the Introduction to Dignitary Protection course for private investigators. Check with your home state to see if there is a reciprocity agreement with North Carolina. South Carolina and Virginia do honor NC PPSB credits as of 12/6/2017 for private investigators.